Asus is making a completely fresh start with the G73; a new design, matt surfaces, an improved cooling system and a DirectX 11 capable graphics card (the HD 5870) all go to make up this 17.3-inch gaming hot-shot. We put the €1,400 machine to the test in our review. The choice of G73 models is still very limited at present. In fact, the G73JH-TY042V we tested is the only model currently available in German-speaking Europe. The G73JH-TY042V can be thought of as the base model of the G73 range, for this reason: the processor is only a Core i5-520M, a mid-range, dual-core processor. It may provide reasonable performance, but a Core i7 would have been more appropriate given the estimated price of around €1,400 and the very high-performance graphics card, an ATI Mobility Radeon HD 5870. The model also comes with 4 GB of DDR3 RAM, a total hard drive capacity of 640 GB (2 x 320 GB), and an HD+ screen with a 1,600 x 900 pixel resolution. Particularly when you look at what's available abroad, you can't escape the impression that Asus is charging its European customers over the odds. Outside of Europe, you can get the fundamentally better equipped G73JH-A2 model, with Core i7-720QM, 8 GB of RAM, 1000 GB hard drive (2 x 500 GB), a FullHD screen, carry case and mouse, for around $1550, which translates to about €1150. Or to put it another way: European customers are being asked to pay more, for lower performance and considerably less in terms of hardware! So those who are used to such things (or those who are happy to experiment) could think about importing the machine. Once you take taxes and shipping into account you do end up with a similar price to the model available here, but you get more performance for your money. 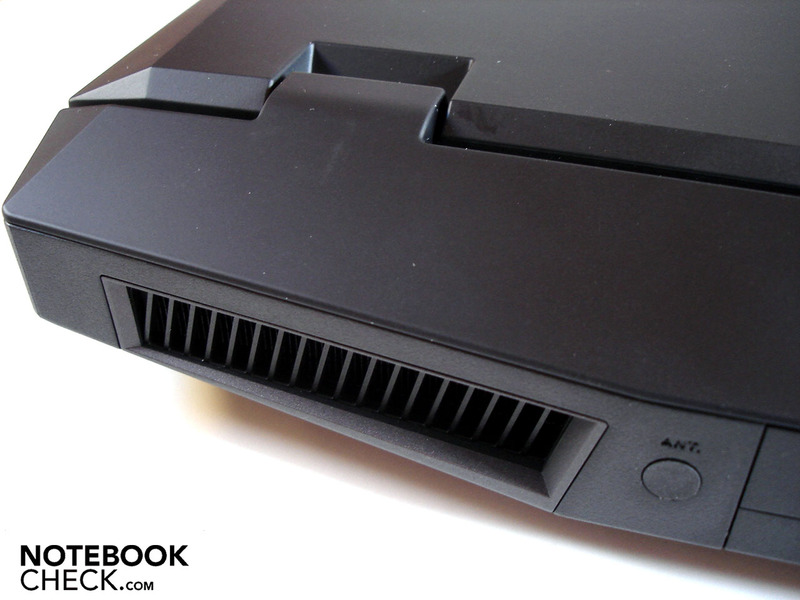 The design of the G73 was partly inspired, according to Asus, by the Lockheed F-117 Nighthawk stealth bomber. The result is a very unique appearance, with a futuristic feel evoked by its streamlined front and unusual features like the large air vents at the back. You also get the definite feeling that Asus has borrowed some elements from Alienware's gaming notebooks (the M11x, M15x and M17x). 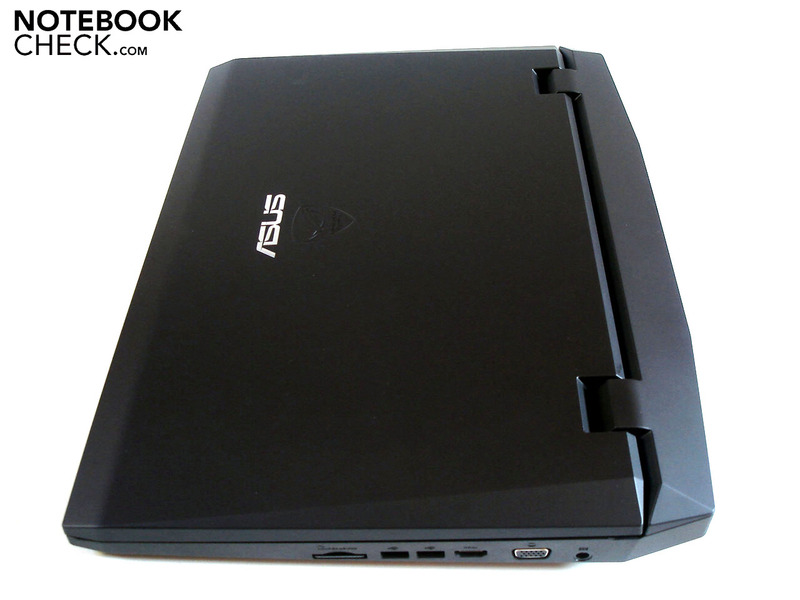 But overall Asus has shown enough originality to distinguish itself from the competition in a positive way. To be honest, it's the matt surfaces more than the design itself which we really like. 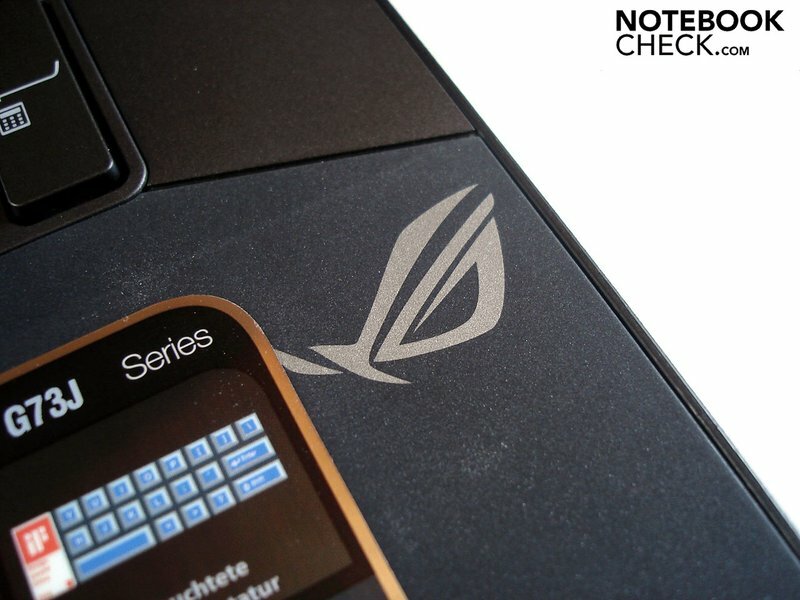 Whereas previous Asus gaming notebooks like the G71 and G72 sported glossy surfaces (making them more vulnerable to scratches and liable to pick up dirt), the emphasis now seems to be on everyday functionality. 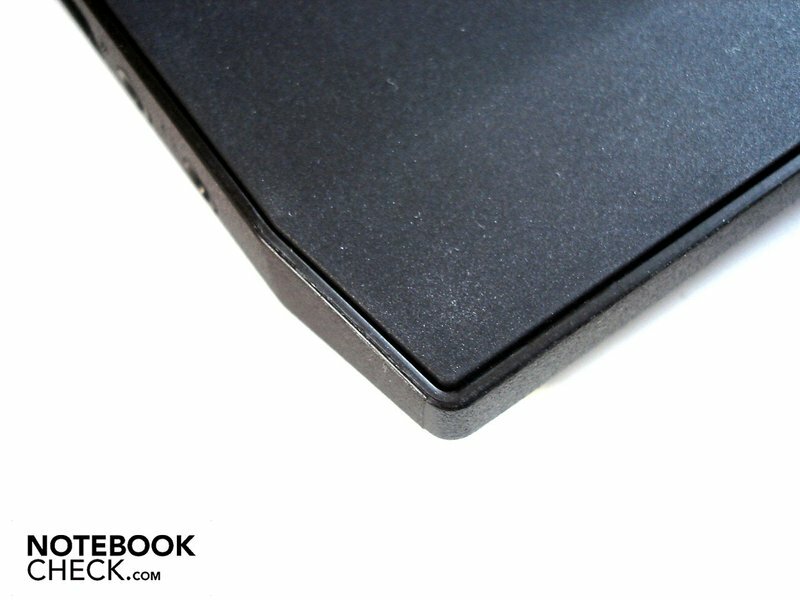 The matt surfaces are very resistant to picking up fingerprints, and are pleasant to the touch thanks to a slight rubber coating. While on paper the G73 may seem quite bulky, measuring 420 x 315mm, the dimensions are cleverly concealed by the sloping design of the side edges, along with the G73's low height of 19mm at the front (57mm at the back). With an acceptable weight of 3.85kg, the G73 can certainly be transported easily, although the lid does rattle annoyingly throughout. In terms of robustness, there is not much to criticize the G73 for. 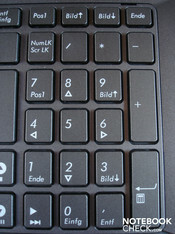 Both the top and bottom of the laptop respond very little to pressure, with the exception of the keyboard area. Likewise, the lid does a good job of resisting torque forces, and you can only bring about distortions in the screen picture by applying direct pressure to the screen itself. The lid's hinges are really quite large, and only provide a very limited opening angle (which is not ideal for tall people). The hinges hold the screen firmly in position, and the base unit only moves a very small amount when the viewing angle is adjusted. When it comes to ports, there are two competing philosophies. 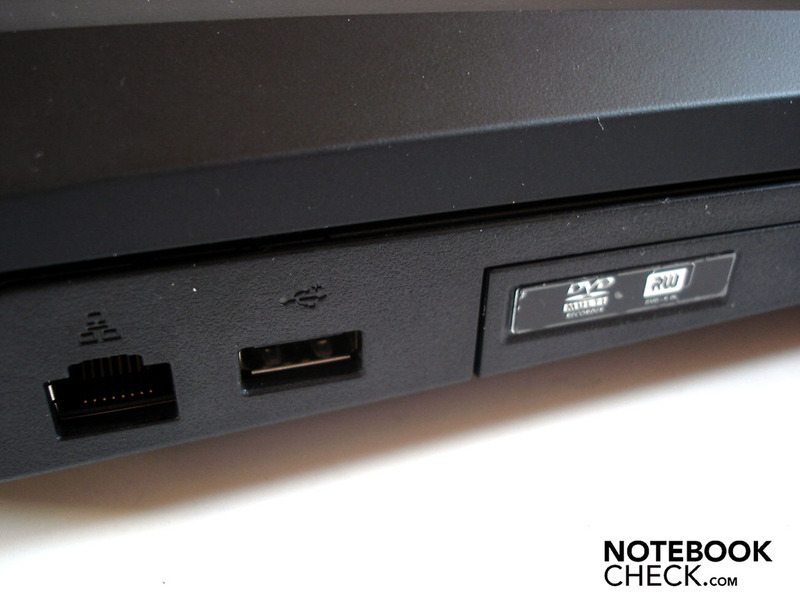 You either put the most important ports at the back of the machine, allowing you space on either side of the laptop (for using a mouse, for instance), but limiting portability somewhat because connecting and disconnecting all the ports back there is a fiddly job. Or, you position the majority of ports on the sides of the machine, which makes them more accessible but does mean that all the cables may get in your way. Asus has plumped for the second of these two options with the G73, not least because the battery and air vents take up a lot of space on the back. 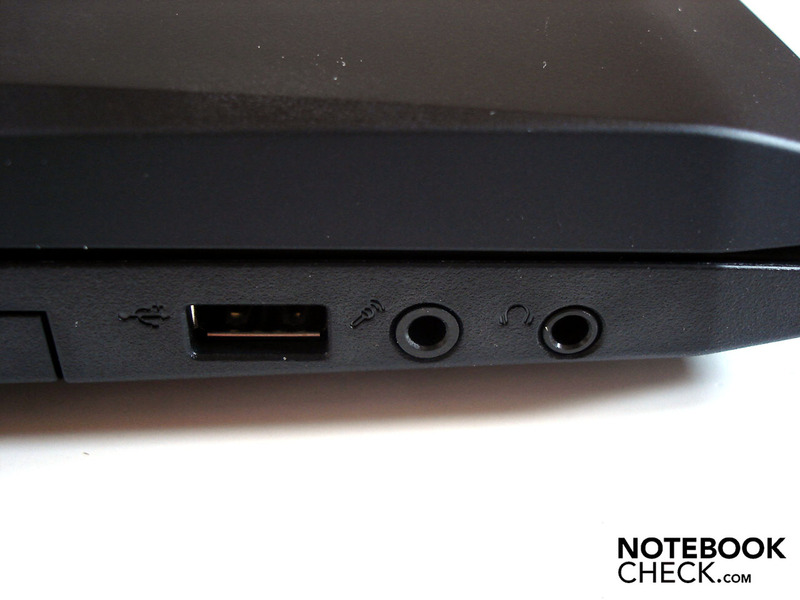 The back edge is clear of ports except for a Kensington lock slot and a single (closed) port for an external antenna. 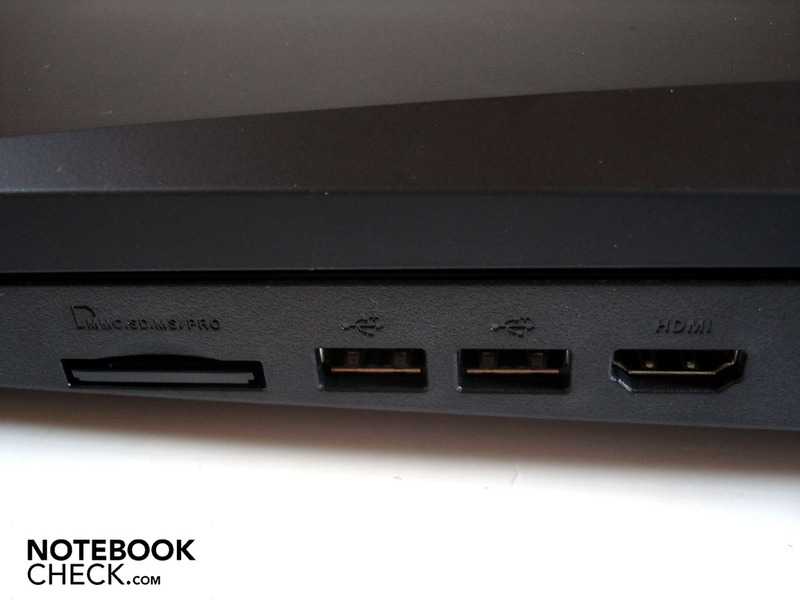 On the left-hand side, near the back, there is a network port and a USB 2.0 port. Next comes the optical drive (a DVD burner) and a further USB. Close to the front of the machine are the two audio ports (headphones/line-out, and microphone/line-in); where best to put these is always subject to debate. 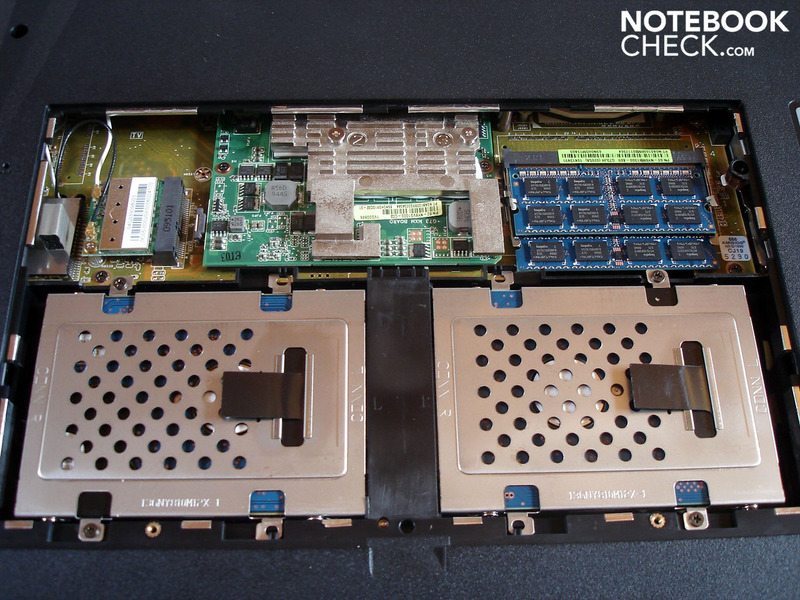 The front edge of the notebook is free of all ports, housing numerous status LEDs instead. 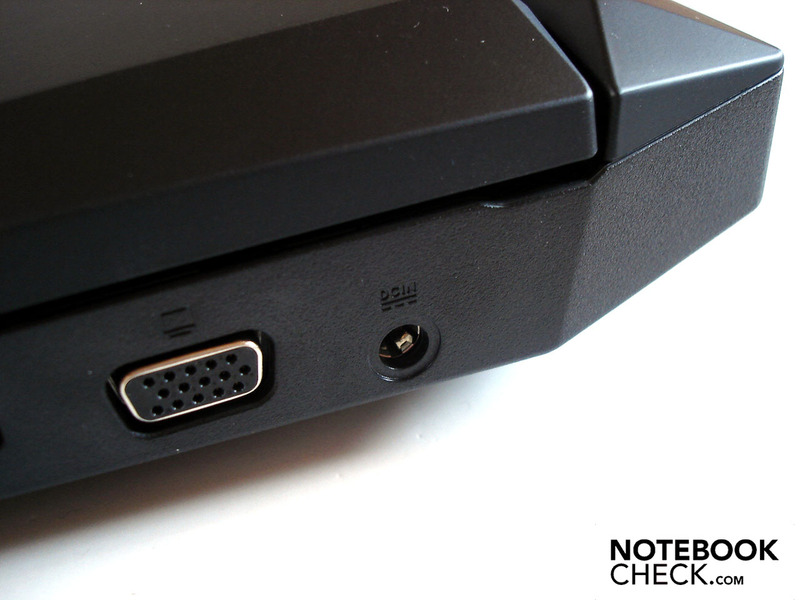 Moving on to the right-hand side; the front third of the right-hand edge has been left completely clear, followed by a multi-in-1 card reader, two further USB ports (making four altogether) and an HDMI port for connecting to an external monitor. Bringing up the rear are the time-honoured VGA port and the socket for mains power. When you have lots of cables sticking out of these ports, they can get in the way of right- and left-handers alike. Also, when the DVD drive opens it can easily collide with cables, which can become thoroughly annoying after a while. 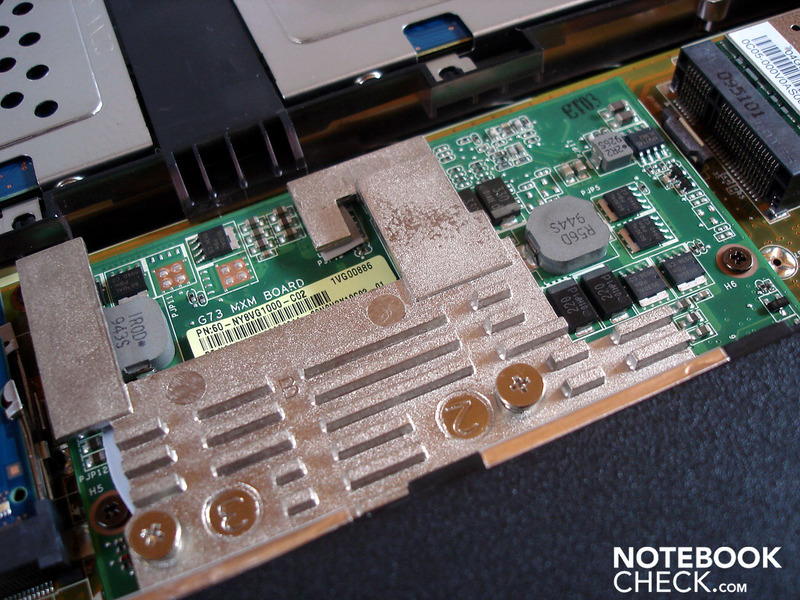 Meanwhile, we found the selection of ports itself to be more than a little disappointing; as you may have noticed, there is no ExpressCard slot, and nor is there an eSATA or Firewire port. Since these have pretty much become standard for gaming notebooks, we would have expected to find them in a laptop costing €1,400. But we have no grounds for complaint as far as wireless connectivity is concerned, as the G73 comes with WLAN (b/g/n) and Bluetooth (2.0). Asus may be venturing into new territory with the G73 in many respects, but sadly when it comes to pre-installed software it remains stuck in its ways. The system is crammed with all manner of pointless software, which often advertises its presence through irritating pop-ups. It also makes the system somewhat sluggish in the condition it is delivered in, and it takes an unusually long time to start up. Once you've removed the dead weight, there are a couple of programs which stand out as being useful. 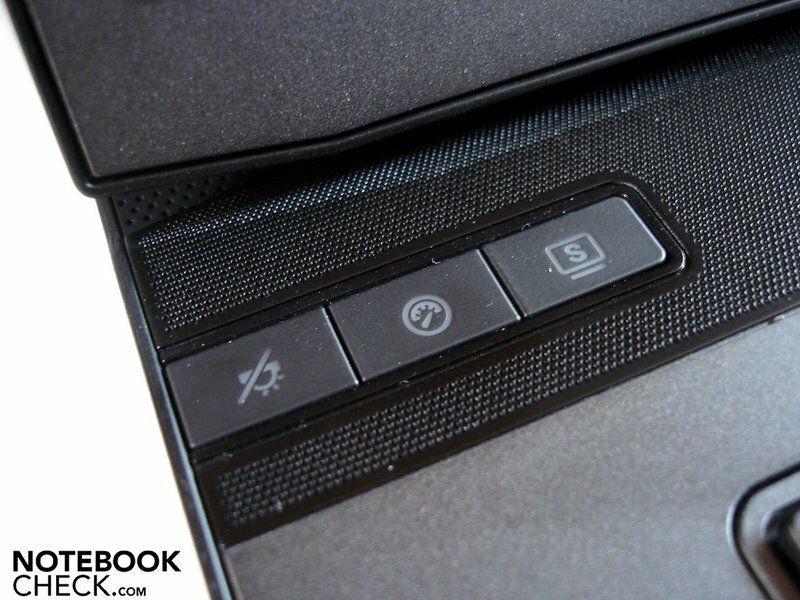 Through the 'control deck' for example you have quick access to important functions like screen brightness, volume, resolution and energy-saving profiles, without having to battle your way through the Windows menus or find the right combination of function keys on the keyboard. 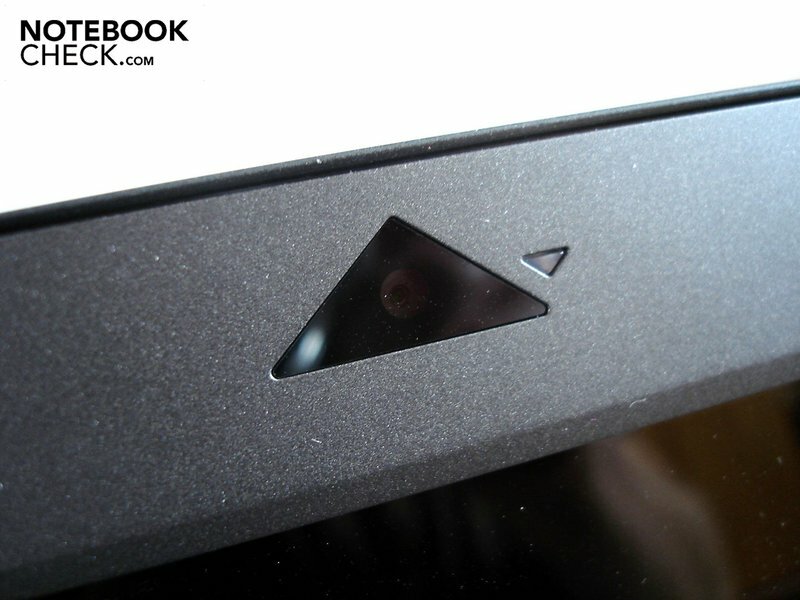 And with the help of Asus's 'Splendid' technology you can adjust the screen picture to suit your own needs, using various modes (for example 'soft' and 'vivid'). But the most significant element of the pre-installed software is probably 'Power4Gear Hybrid'. This involves four energy profiles, exclusive to Asus, in addition to the three recognised by Windows; with 'Power4Gear' you can adjust the most important settings through a clearly laid out interface. 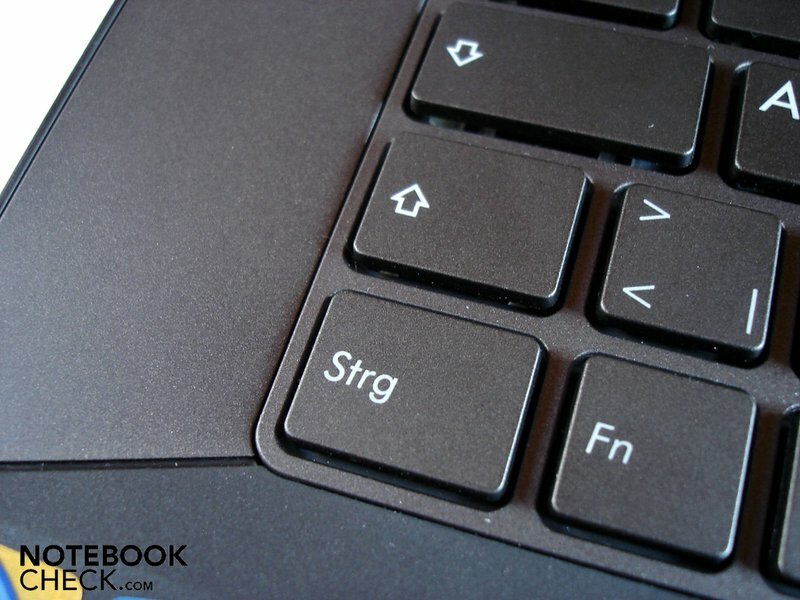 The smart, chiclet-style keyboard impressed us favourably at first. But after a short while, some weak points became apparent. Firstly we found that the response from the keys felt very spongy. 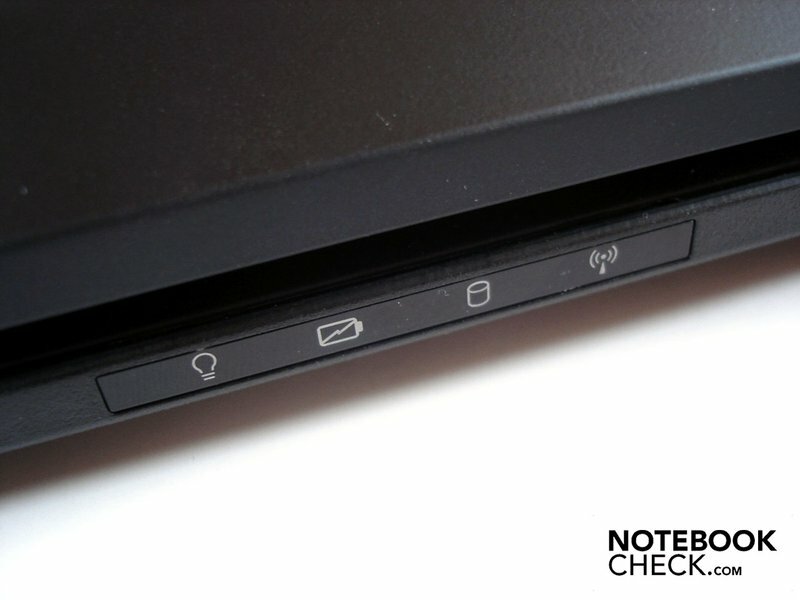 Secondly, the keyboard flexes noticeably, particularly in the area to the left above the DVD drive, in response to relatively small amounts of pressure. Also, the arrow keys and the number pad keys are rather narrow, despite the fact that there is actually plenty of room for them. However the keyboard does score some points for its practical layout and the adjustable keyboard backlighting, which is a discreet white colour and helps you orientate yourself in complete darkness. 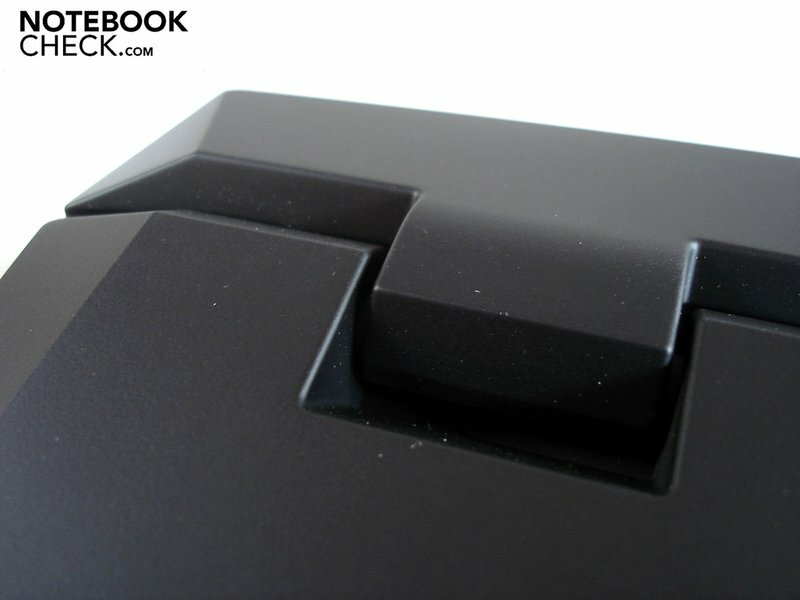 The black touchpad is barely distinguishable from the surrounding area in terms of colour, and only a slight dip from the level of the palm rest alerts you to its presence. 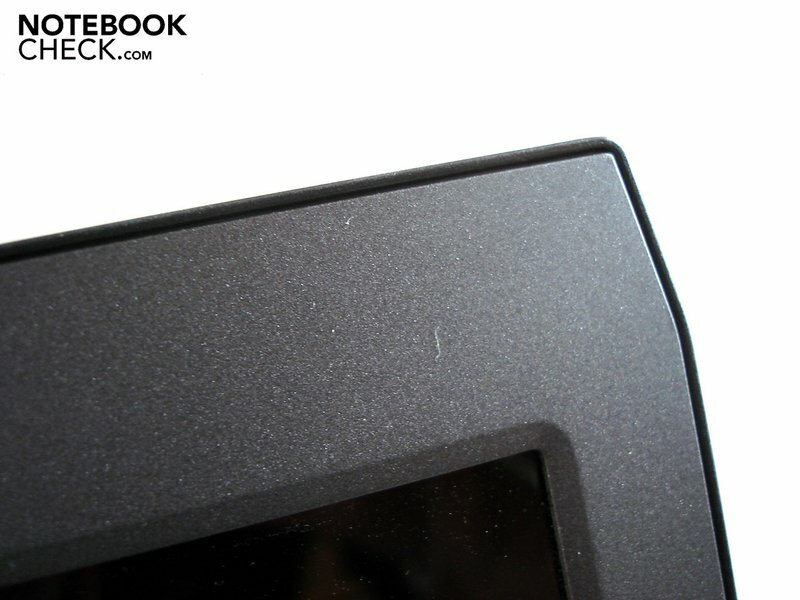 However, its smooth surface lets the finger glide easily across it. The best thing about it is its extremely generous size, allowing you to cover great distances on the monitor without setting the mouse sensitivity to high. 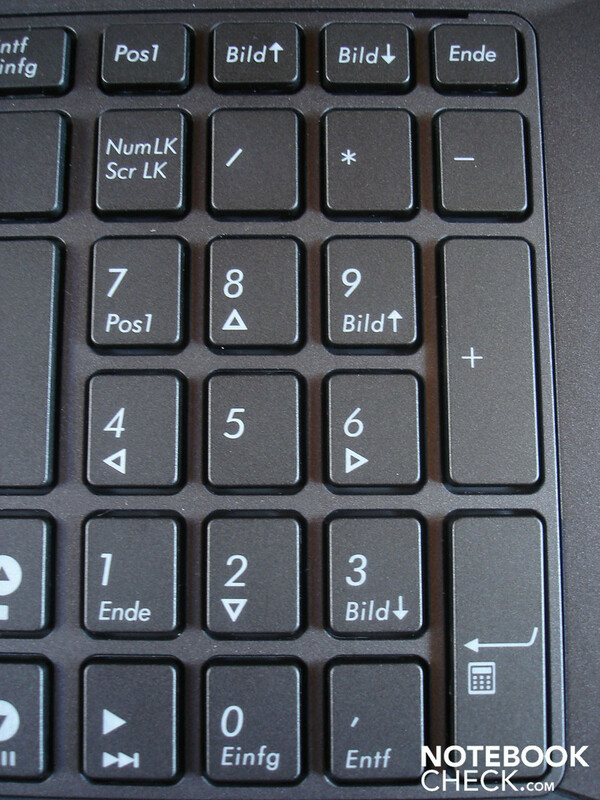 On the other hand, we did not like the two touchpad keys - combined into a single, very long bar - in the slightest. The tactile feedback is very poor and ill-defined; and as a result of this, pressing the button does not give you the audible feedback which is so badly needed. The 17.3-inch screen provides plenty of space for surfing the internet, and for films and games in particular. But we can only express our disbelief at its resolution of 1,600 x 900. For starters, it makes the picture look slightly grainy. 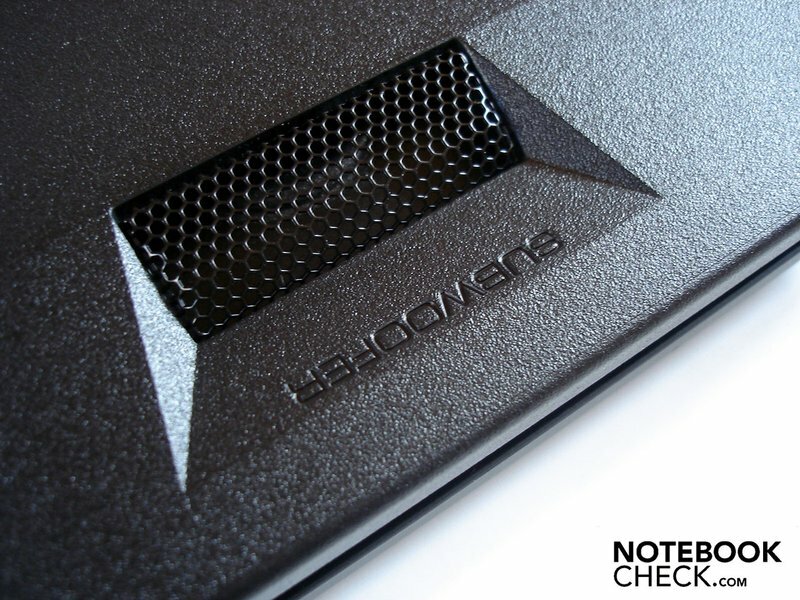 And what's more, the notebook's Radeon HD 5870 graphics card is actually one of the few that can do justice to demanding games in their FullHD resolution of 1920 x 1080. 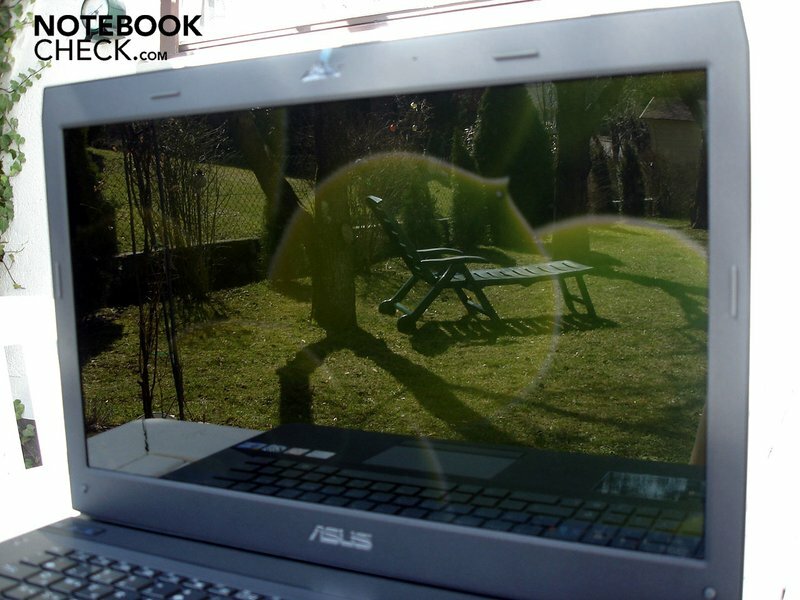 When you turn the notebook on, you immediately notice how bright the screen is. With an average brightness of 230.1 cd/m², it is much brighter than most of the competition. 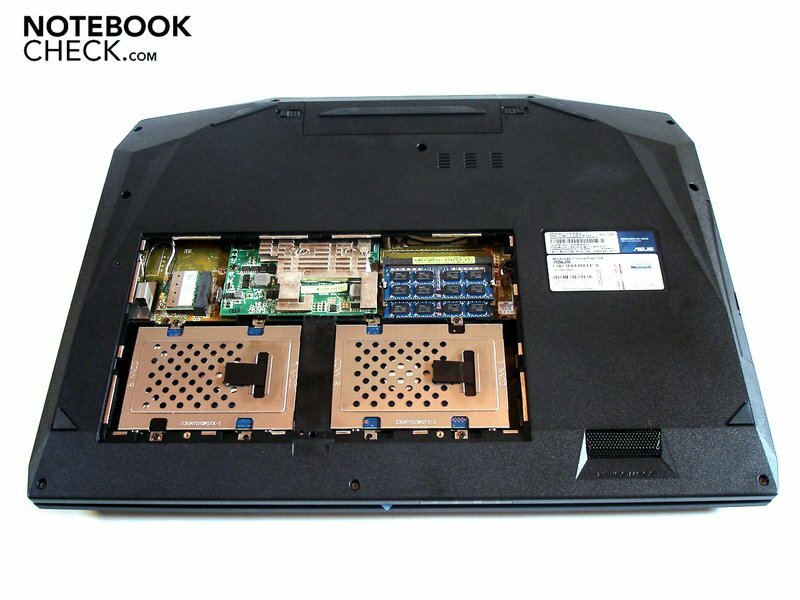 Your average gaming notebook has between 160 and 200 cd/m². The uniformity of brightness is also very good, at 91%. But during the course of our gaming benchmarks a number of problems arose. While we were testing the first-person shooter Fear 2, the dark areas were greyish rather than deep black, because of the relatively high black level of 1.27 cd/m². The contrast ratio of 190:1 is also quite low. However, the vivid colours do go some way towards making up for this. The display brightness on battery power remained constant, but despite that the G73 is not well suited for outdoor use; the high-gloss screen gets hit by strong and extremely disruptive reflections, which obscure almost everything on the screen. Reflections can also be a problem indoors. 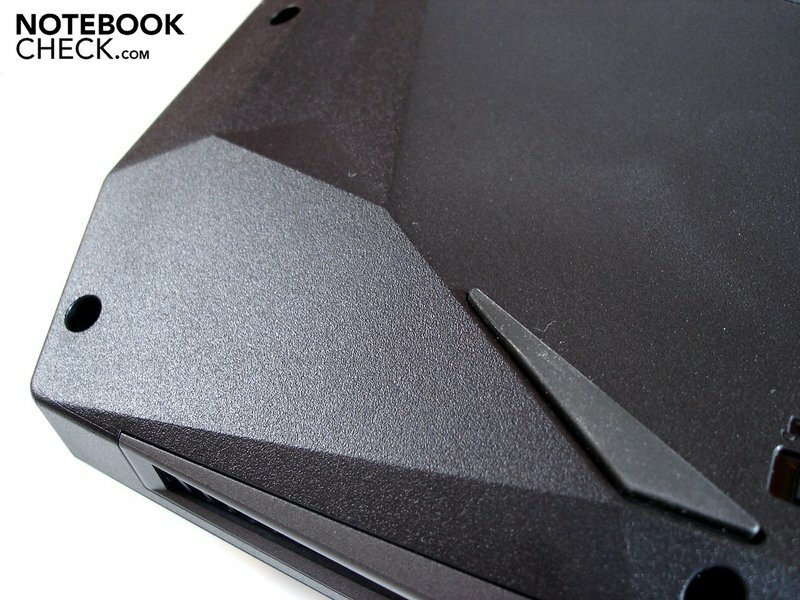 But seeing as virtually all gaming notebooks (with the exception of the Clevo Barebones) are only available with glossy displays, users will have to like it or lump it. The viewing angles also turned out to be rather modest. Particularly in the vertical direction, even the smallest deviations from the ideal viewing angle were enough to distort the brightness and colours. The viewing angles are somewhat better horizontally, but still, you should not position yourself at too much of an angle to the G73. Asus has opted for a dual-core Intel Core i5-520M processor. If you wonder why the Core i5-520M appears to be a four-core processor in the task manager window - hyperthreading technology simulates two virtual cores alongside the two actual cores. Being able to process four threads simultaneously does not currently provide much of an improvement in terms of gaming performance, though certain applications can profit greatly. Of more significance for gamers is the Turbo Boost function. This is where the processor can automatically overclock from 2.40 to 2.93 GHz. 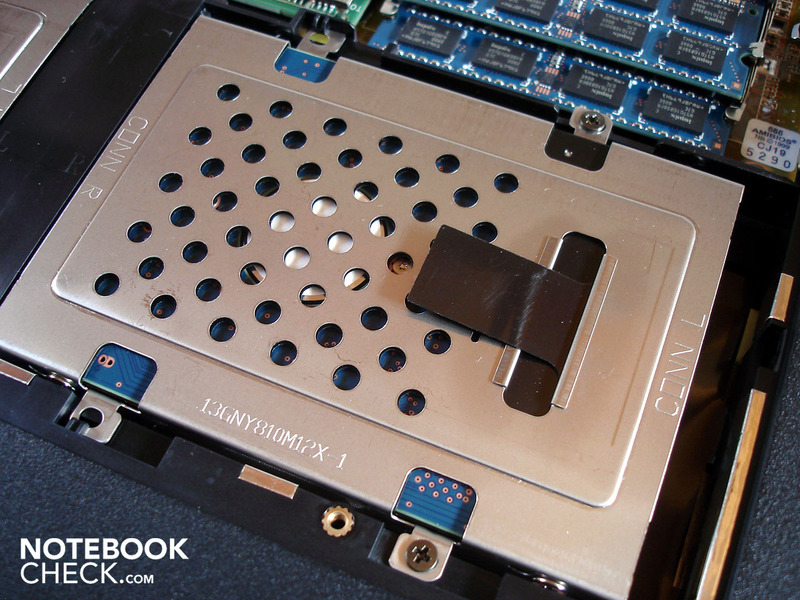 But the Turbo Boost technology can only operate if the notebook's cooling system does too, since this kind of overclocking can cause the CPU temperature to shoot up to as high as 100 °C. The processor was produced using the 32nm process, and also comes with 512 KB of L2 and 3MB of L3 cache. Its energy consumption (35 Watts) is above average; but Intel's four-core processors in the Core i7 range use even more at 45-55 Watts. Another feature of the Core i5 is its 45nm, integrated graphics chip, the GMA HD. But performance-wise, the GMA HD is on the modest side, at about the same level as the HD 4200. 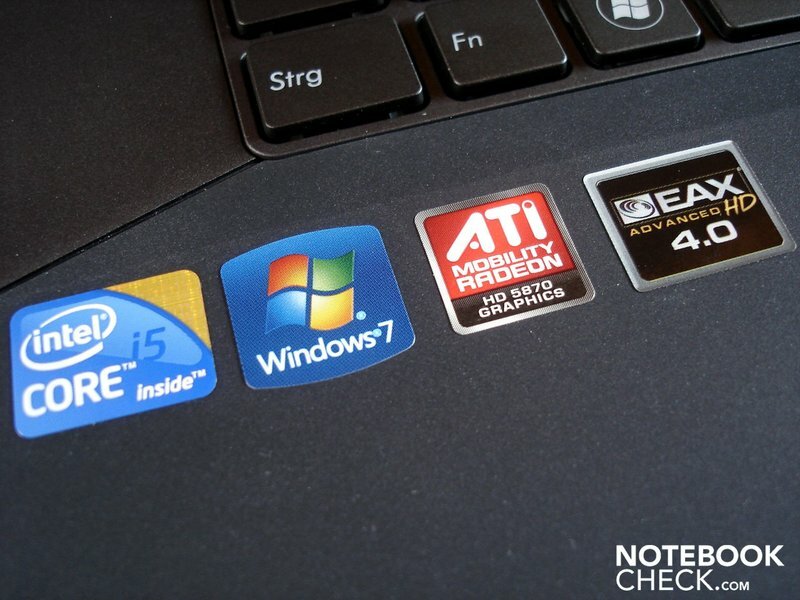 But who needs a GMA HD when you also have the extremely powerful ATI Mobility Radeon HD 5870 under the hood of the G73? As we already saw in our review of the Deviltech Devil 9700 DTX, the Radeon HD 5870 is the fastest single-chip graphics card currently available. And along with its sheer present-day power, it is also well-equipped for the future as it supports DirectX 11. The 128 bit memory interface may be a little small, but the HD 5870's fast GDDR5 video memory can compensate for that. Having 800 unified shaders means that in theory the card should have a substantial processing power of 1.12 TFLOPS. The number of transistors is also impressive, at 1040 million. Its speed is 700 MHz for the core and 1000 MHz for the total 1024 MB of memory. However, when you compare these specs with the desktop versions of the HD 5000 series, the Mobility Radeon HD 5870 ranks below the HD 5770. So while the graphics card may be the best possible for a notebook, it is only just above mid-ranking in relation to desktop machines. Other features worth mentioning are its eight-channel HDMI audio output and its Avivo HD technology (UVD2), which takes some of the load off the CPU while rendering high-resolution video material. Finally, the card's energy usage is very high, up to 60 Watts; so we can expect the battery life to be quite short. The Intel Core i5-520M should score highly in the Cinebench R10 (64 bit) test. The dual-core processor achieved 3,957 in the single-core rendering test, and 8,162 points in the multi-core rendering. Intel's popular quad-core Core i7-720QM is somewhat slower in the single-core rendering, with 3,690 points, but is considerably ahead in the multi-core test with 10,073 points. In the 3DMark test, we were especially interested in comparing it with its DirectX 10 capable Nvidia rival, the GeForce GTX 280M. In the 3DMark05 test, the Radeon HD 5870 scored 18,396 points, slightly less than the GeForce GTX 280M with its 18,414 points. The results for 3DMark06 were similar - while the HD 5870 scored 12,356 points, the GTX 280M managed 12,569. But in the latest version of 3DMark, 3DMark Vantage, the tables turned and the HD 5870 took the lead in the GPU score (in which sheer graphics power is what counts above all), by 7,519 to 6,328. In the Windows 7 performance index, the graphics card comes out top of the pack with two scores of 7.2. The processor comes in next with 6.7 points, showing it is a little underpowered for the job. The RAM and hard drive bring up the rear with an acceptable 5.9 points. Two 320 GB Hitachi hard drives provide a respectable total capacity of 640 GB. Asus has decided to do without a RAID array. But it did decide to divide the two hard drives into four partitions in all. This approach may be alright for the system hard drive, but most users would probably rather that the second hard drive had been left unpartitioned. The transfer rate is very high for an HDD, at 70.7 - 72.9 MB/s (though SSDs will achieve about double that). The application performance is very good. The Core i5-520M offers more than enough performance for everyday use, even when it involves extensive multi-tasking, high-resolution video content and so on. Graphics-intensive applications are dealt with by the Radeon HD 5870 slightly better than the GeForce GTX 280M. In order to keep the gaming benchmark tests as close to reality as possible, they were all carried out with the screen's native resolution of 1,600 x 900. Also, the integrated 'Twin Turbo' feature, which drives the processor speed to above 3.00 GHz, was always enabled. The horror first-person shooter Fear 2 gets on especially well with ATI graphic cards. On high settings and 4 x AA we achieved an excellent average refresh rate of 76.0 fps. It is a little bit choppy from time to time, but this can mainly be attributed to the saving process. Modern Warfare 2 has not been on the market for that long, and so it is particularly demanding for hardware when it's on its highest detail settings and 4 x AA. However, at 55.4 fps, the Asus G73 has nothing to feel ashamed of; on the contrary, the gaming experience was very fluid. The newest title in the Battlefield series is selling very well despite numerous technical problems. On high settings and including 4 x AA and 8x AF, Bad Company 2 runs relatively smoothly at 37.3 fps, apart from occasional performance issues. If you deactivate anti-aliasing and anisotropic filtering, you get an even smoother performance with 45.7 fps. As you can see from the performance graphs, the frame refresh rates fluctuated wildly in Anno 1404. This is because of the different levels of graphics that are required for the various zoom settings. Still, even with very high detail settings and 4 x AA, you can have a pleasant evening of strategy and city-building with a frame rate of 57.7 fps. Need for Speed Shift looks great if you have the right hardware for it. With the G73 you can enjoy the supercars at 43.0 fps on high settings and with 4 x AA. This even improves to 49.4 fps when anti-aliasing is disabled. So far hardly any mobile graphics cards have managed more than 35 fps for the RPG Risen on high settings and 4 x AF. And the Asus G73 is no exception, reaching 34.4 fps. However, as third-person RPGs already look pretty smooth at around 30 fps, it is not really necessary to turn the details settings down or to forgo any graphical enhancements. It will be some time before any game knocks Crysis from its throne; with the exception of its own sequel, its graphics remain unsurpassed, with no other likely candidate in sight. With the Radeon HD 5870, Crysis can be played on high settings at a pretty playable 34.0 fps (integrated GPU benchmark). If you increase the details to the very highest settings, performance begins to deteriorate noticeably, and the game chugs along at 20.4 fps. Nevertheless, the HD 5870 is one of the few graphics cards which can keep Crysis playable at a high resolution and on high settings. This visually first-rate game is the first to use DirectX 11 to its full potential. You can race quite happily over the rally tracks at a frame rate of 31.0 fps, with very high detail settings including 4 x AA. On the high settings, Dirt 2 runs a bit more smoothly at 37.0 fps. We have hardly ever seen this level of gaming performance in a notebook that sells for less than €1,400. ATI's Mobility Radeon HD 5870 can smoothly play all the games we tested in its native resolution of 1,600 x 900 with high detail settings and often with additional graphical enhancements (AA and AF). As long as the system requirements for the next generation of games are not too wildly inflated, the G73 will provide you with a solid gaming platform which will not be outstripped by technological developments for at least a few more years. This is as long as games do not start requiring four-core processors to run. 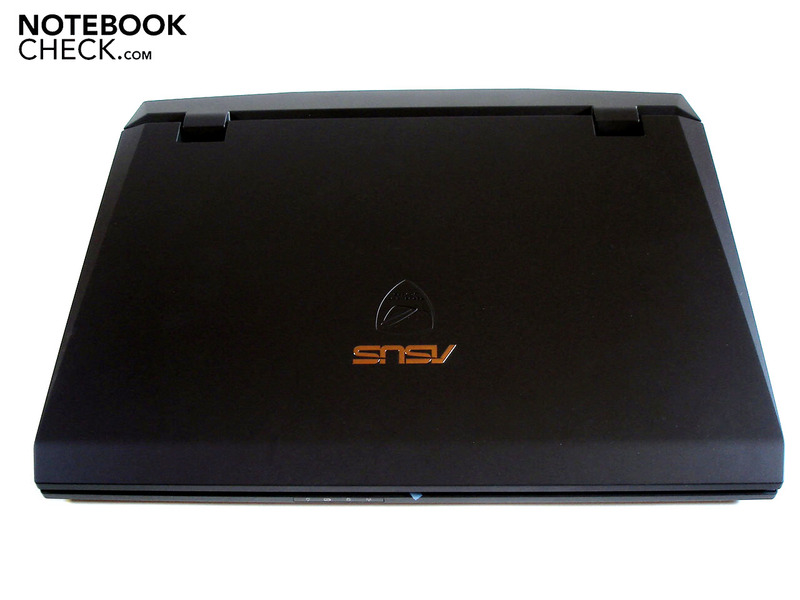 Gaming notebooks are notorious for their relatively noisy systems. 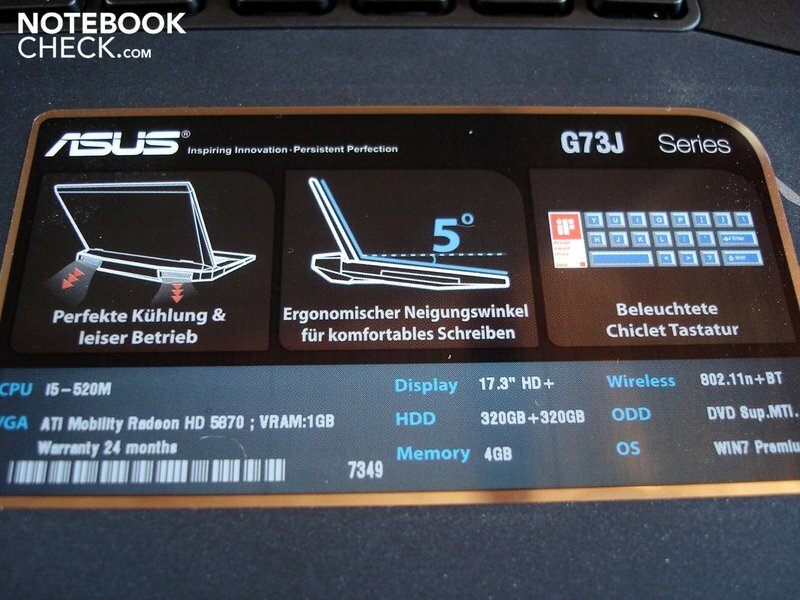 But in this respect, the Asus G73 is a pleasant surprise. 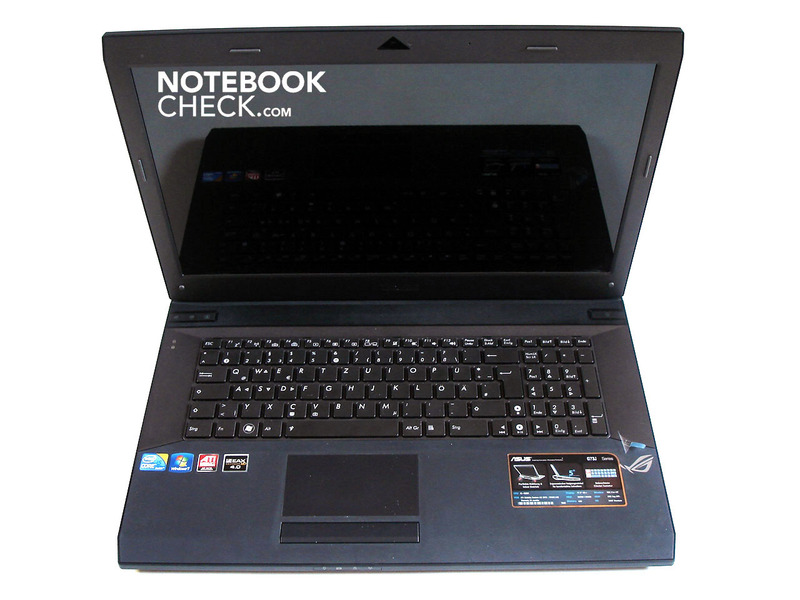 In idle mode, the notebook is only moderately audible at 32.8 - 33.5 dB(A). The DVD drive is not much louder during playback, at 34.9 dB(A). If the stress on the system increases (because of games, for instance), the noise level only rises a little to 34.6 dB(A). Only under very heavy use, the kind you don't normally get in practice, does the G73 reach a clearly audible but still completely acceptable 38.1 dB(A). The sound from the fan also has a pleasant quality; all in all, the G73's system noise is exemplary, and you can barely hear it when playing music, games or films. This is all the more surprising as you would expect the Radeon HD 5870 to heat up and require the fan to speed up and get much louder; this is what we found, for example, in our review of the Deviltech Devil 9700 DTX. 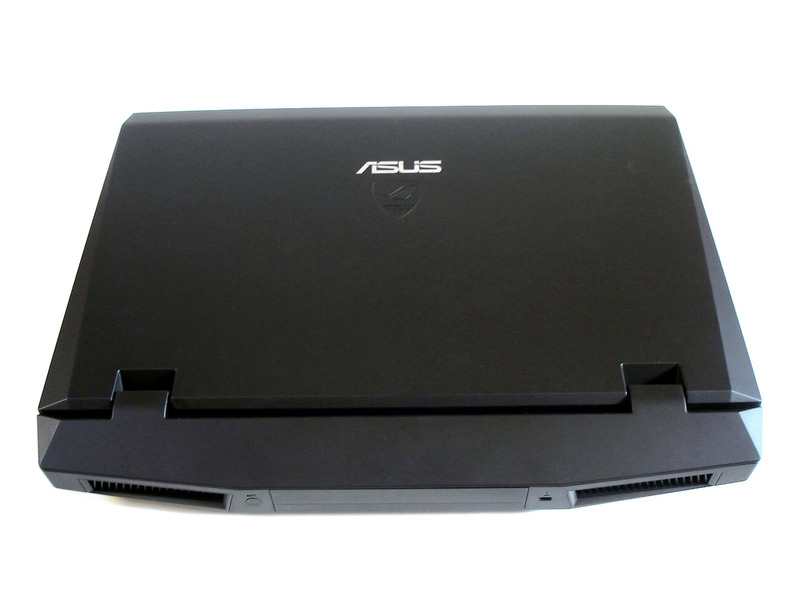 This new kind of cooling system which Asus has deployed in the G73 is a genuine success. Now you might think that the relatively quiet system must have been achieved at the expense of the cooling. But you would be wrong - in fact the G73 stays pleasantly cool both in idle mode and under heavy use. 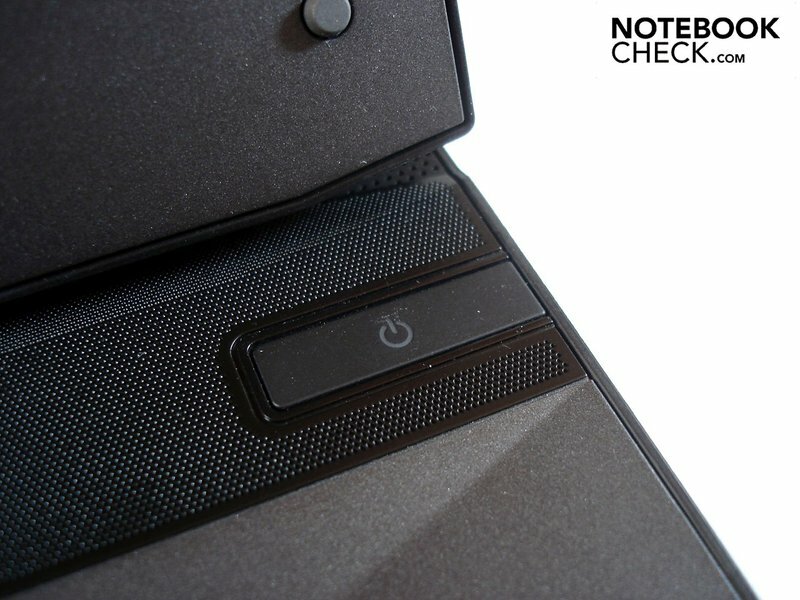 In idle, the surface temperature does not go above 30.1 °C; and under heavy use the top side of the laptop reaches a maximum of 33.8 °C, which is also an excellent temperature. 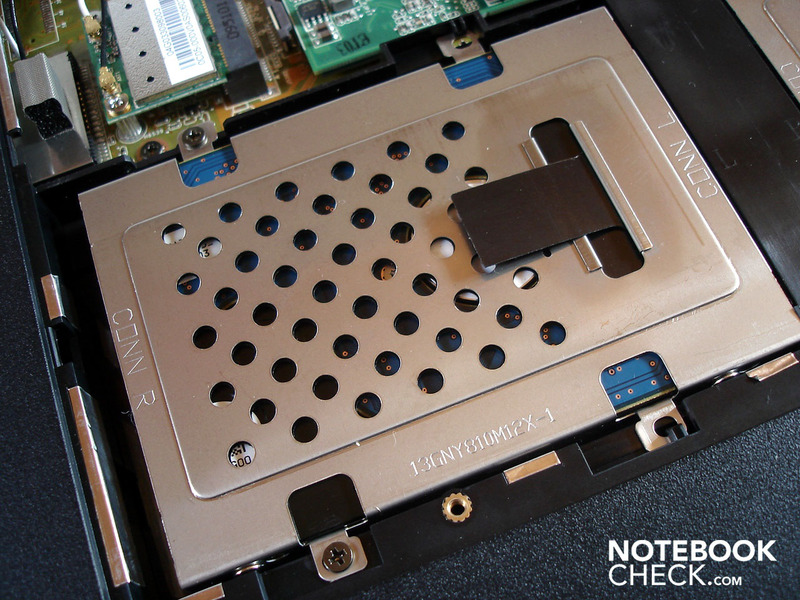 Only the underside of the notebook heats up a little, to 37.1 °C. The palm rest area only gets as warm as 24.2 °C, so the chances of your hands getting too hot from resting there are remote. In our longer test, in which we subject the CPU and GPU to the maximum possible pressure over several hours (using Prime and Furmark), there was also nothing unusual to report. The components whose temperature could be measured were always found to be at a safe level. (+) The average temperature for the upper side under maximal load is 27.6 °C / 82 F, compared to the average of 32.9 °C / 91 F for the devices in the class Gaming. (+) The maximum temperature on the upper side is 33.8 °C / 93 F, compared to the average of 39.3 °C / 103 F, ranging from 21.6 to 68.8 °C for the class Gaming. (+) The average temperature of the palmrest area of similar devices was 28.7 °C / 83.7 F (+3.6 °C / 6.5 F). 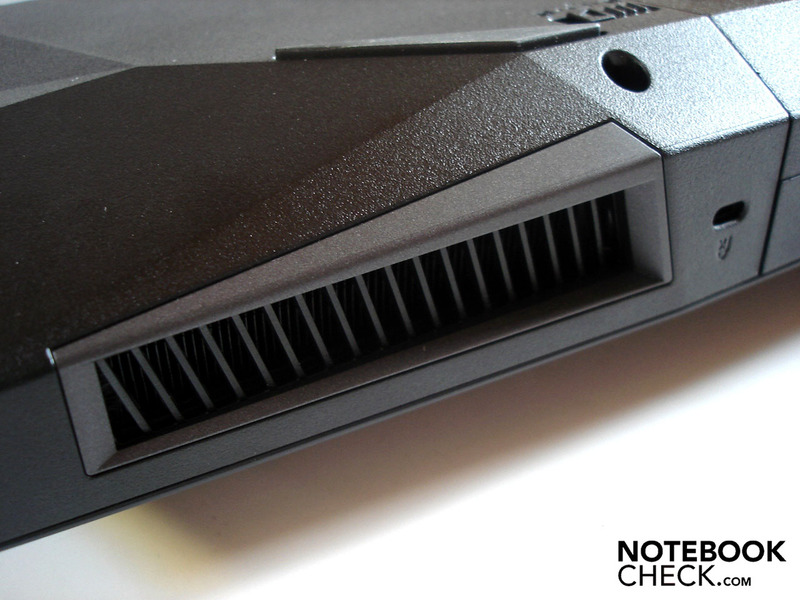 Most notebook loudspeakers are an insult to the ears, but the G73 actually manages to offer above-average sound quality. The subwoofer, housed on the underside of the base unit, provides a full bass sound for games particularly; it means you never lose the 'booms' during firefights and explosions, although it may come across as a little too boomy. Films are also fun to watch with the built-in sound system, though voices can sound a little flat and hollow. It's also noticeable when listening to music that the sound reproduction is not 100% accurate. 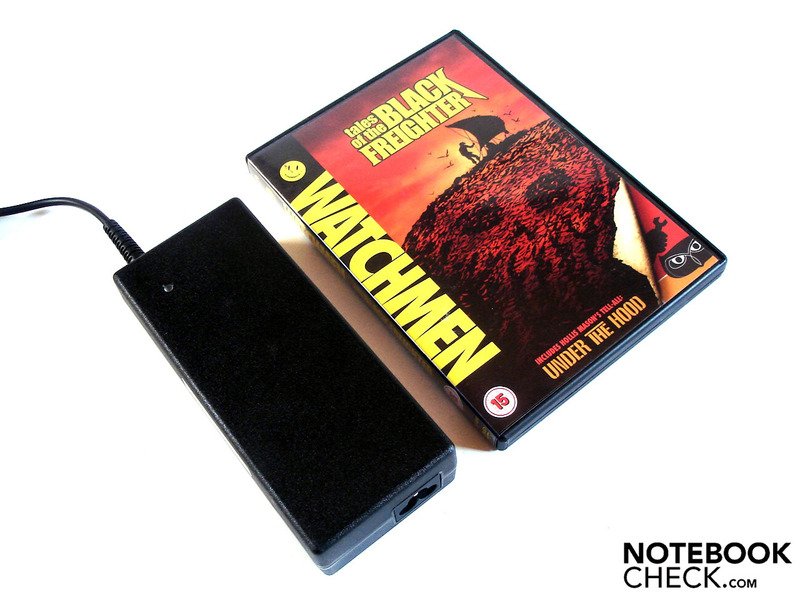 But the high maximum volume guarantees you a balanced multimedia sound even if you sit some distance from the notebook. The G73 also gets bonus points for supporting two systems developed by audio specialists Creative. EAX 4.0 (environmental audio extensions) allows you to enjoy enhanced sound effects in certain games. Background noises are matched to each individual situation, to create as realistic an effect as possible. If you want to experience EAX at its best, give Thief 3 a try. When the thief Garrett creeps through the Hammerite church, for instance, the background noises are uncannily life-like, creating a cinematic experience that you won't forget in a hurry. 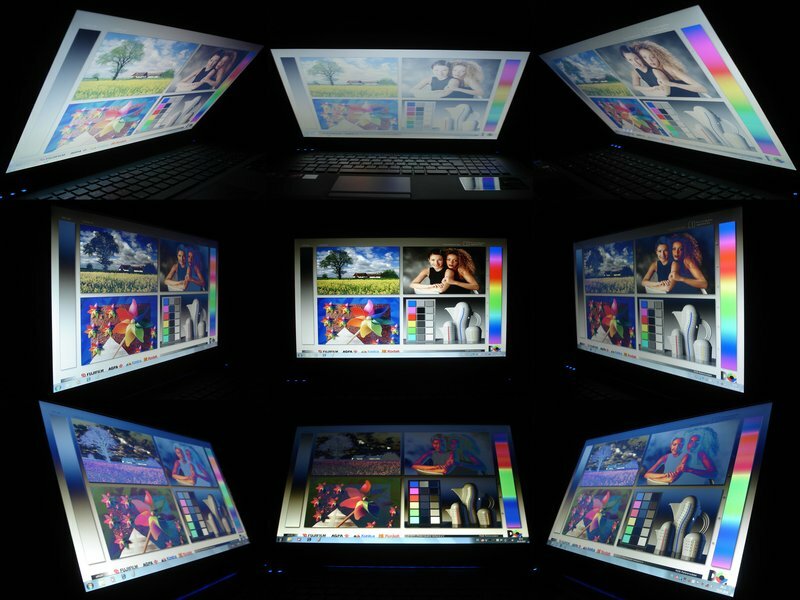 Additionally, the G73 supports a technology called CMSS-3D. This can produce a surround-sound effect from stereo sound, turning your perception of background noises into a completely new experience, particularly with stereo headphones. All in all, Asus delivers a convincing sound experience with the G73, and you will not necessarily want to hook up an external sound system. 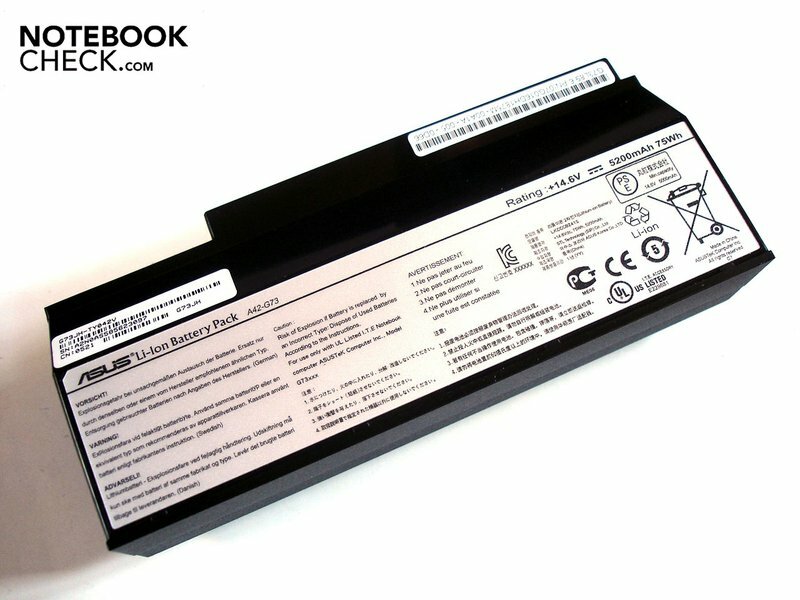 The 75 Wh lithium ion battery really does try to keep the G73's battery life at an acceptable level, despite its energy-gobbling components. And it succeeds very well, at least in the Battery Eater Readers Test, where it runs with the minimum screen brightness and maximum energy-saving settings. With 2 hours and 39 minutes of battery life, you can spend a decent amount of time away from a power outlet. If you turn the brightness back up to maximum and surf wirelessly on the web with the medium-level energy-saving options enabled, the battery life sinks to 1 hour and 58 minutes, which is still acceptable. Watching a DVD only cuts the G73's battery life by a little more, coming in at 1 hour and 36 minutes. So you may not get all the way through the longer films, but it's more than enough for watching the odd episode of your favourite show. 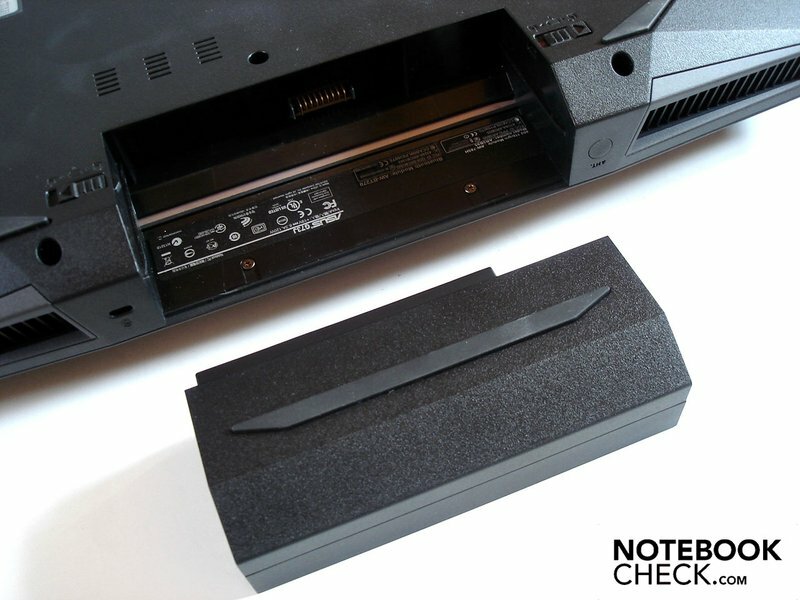 Even when under heavy use (Battery Eater Classic Test), the notebook managed to last for 71 minutes without any energy-saving settings. As the saying goes: 'You can't make an omelette without breaking eggs'. And, by the same token, it is no wonder that the energy consumption of the G73 with its powerful components is not exactly low. While the G73 consumes a fair amount of electricity (35.8 - 43.2 Watts) even in idle mode, this becomes 84.4 Watts when it's under heavy use. If you activate the 'Twin Turbo' mode and also charge the battery at the same time, you can reach 127.4 Watts under heavy use. So this does exceed the rated capacity of the 120 Watt mains adaptor by 7.4 Watts. 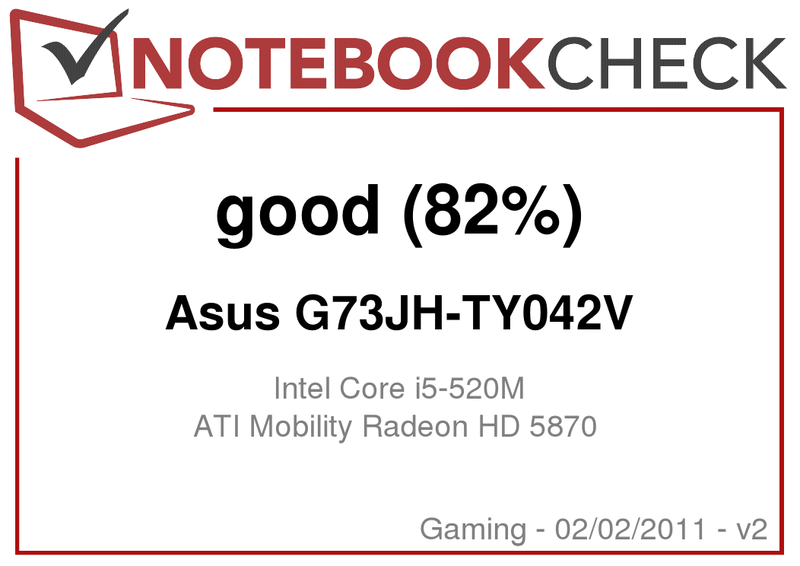 Asus has created a surprisingly good gaming notebook in the G73, one that stands apart from its G71 and G72 predecessors in many respects. The futuristic design along with the stylish keyboard backlighting should attract admiring glances. Matt surfaces and good workmanship also give the G73 a high-quality appearance. A generously sized touchpad and impressive sound quality are further strengths of this 17.3-inch gaming notebook. What really won us over was its high gaming performance, courtesy of the extremely powerful ATI Mobility Radeon HD 5870 graphics card. And there's more: the excellent cooling system also guarantees you a cool and quiet experience at all times. 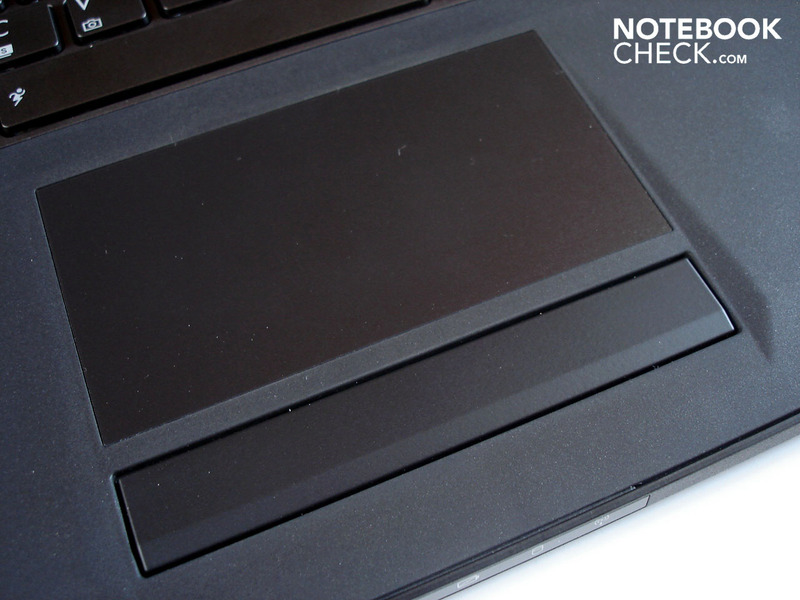 The only blots on an otherwise spotless copybook are a spongy keyboard, the incomplete range of ports, and the mediocre screen with its high black level, poor contrast ratio and limited viewing angles. The G73 just manages to secure a very good overall score of 88% in our review. 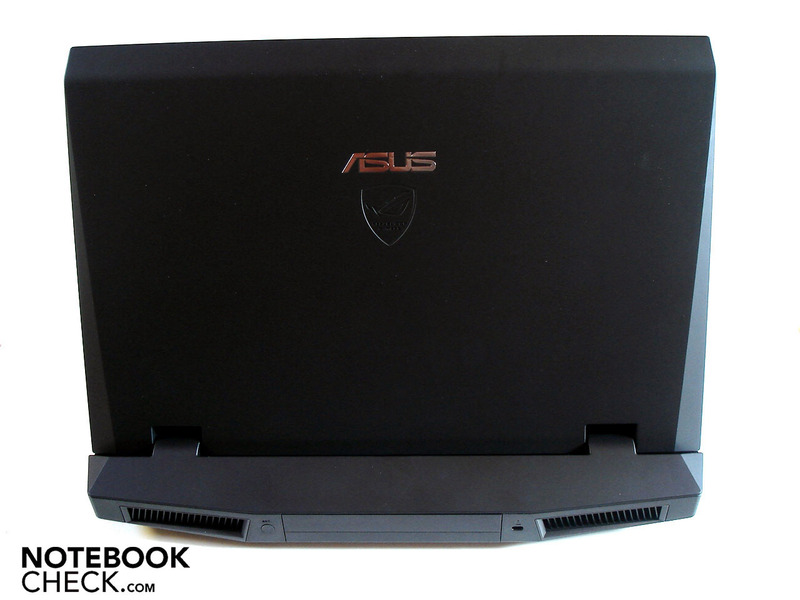 If you are looking for a powerful and yet cool and quiet gaming notebook, with a stylish appearance and good sound quality, you may find what you are looking for with the Asus G73. There are slanting edges everywhere. Some of them are quite severe. followed by an 8-in-1 card reader, two USBs and an HDMI port. along with a fourth USB and the audio ports. Finally, Asus has turned its back on glossy surfaces. The G73's surfaces are all matt. The gaming performance can be classed as 'very good' thanks to the Radeon HD 5870. Almost every modern game can be played smoothly in the native resolution, with high detail settings and with visual enhancements (AA and AF). Also, the smart, well-made case is convincing in terms of quality. Given the powerful graphics card, a quad-core processor would have been nice. The screen could also have been better - the viewing angles are genuinely limited and the contrast ratio is poor, with a black level that is too high. The glossy display can also not be opened very far. 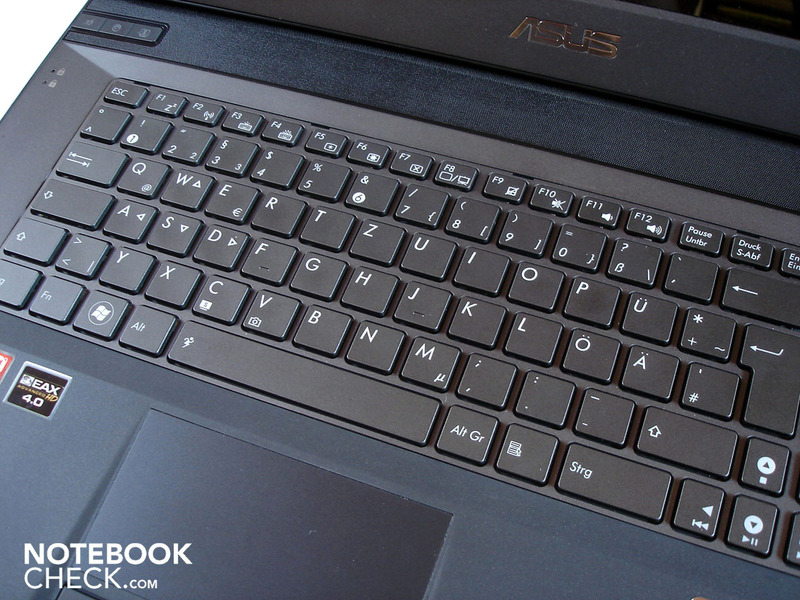 The Asus G73 remains astonishingly cool, and does not get too loud even under heavy stress. This is rare for a gaming notebook. Furthermore, the sound quality (particular during games) is surprisingly good. 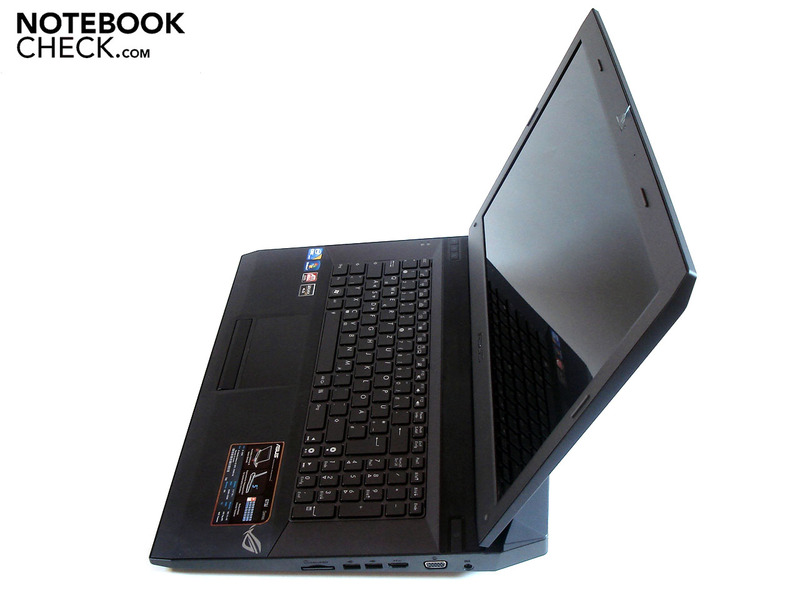 Powerful and DirectX 11 capable gaming notebooks with the Radeon HD 5870, such as the Deviltech Devil 9700 DTX, the Fragbook DTX, the Cyber-System Si17/Si15, the mySN XMG7.c/XMG6, the Notebookguru Fire i7/Storm i7 or the Hawkforce GameForce M17G/M15G.